This year, I had not planned on us having a big Thanksgiving celebration. My sister will be in town next week, and we all planned to do Thanksgiving, Christmas, and a family birthday all together in one big "do." I scheduled myself to work Thanksgiving and, really, almost every day this week. I'm home today, but worked the past 2 days, will work the next 2 days, and again on Sunday. Then my husband's sister and her family asked if they could come visit for the holiday. I said, as long as you don't mind that I'm working! They didn't, and they're here, some of them, anyway. Their kids are due to fly in tonight, snow permitting. A few days ago I made the squash and creamed broccoli side dishes. I will make the stuffing today. Last night I made a pumpkin pie and this morning I made the apple pie. And a few tarts. I will show the finished pies tomorrow, when I can photograph them with all the feast trimmings, but here are the tarts which will be eaten by the kids for lunch, I'm certain. For the crust I used half butter and half lard (regular, not leaf) and I cut down on the salt because the crust I made last night for the pumpkin pie seemed a little too salty. I might have cut down too much, so for future reference maybe 3/4 tsp. in the batch is OK if using lard. Half a teaspoon isn't enough. The filling is 8 cortland apples, 1 cup of sugar, 1 tsp. cinnamon and a pinch of freshly ground nutmeg. I took the rest of the crust and made 2 little tarts with strawberry filling. 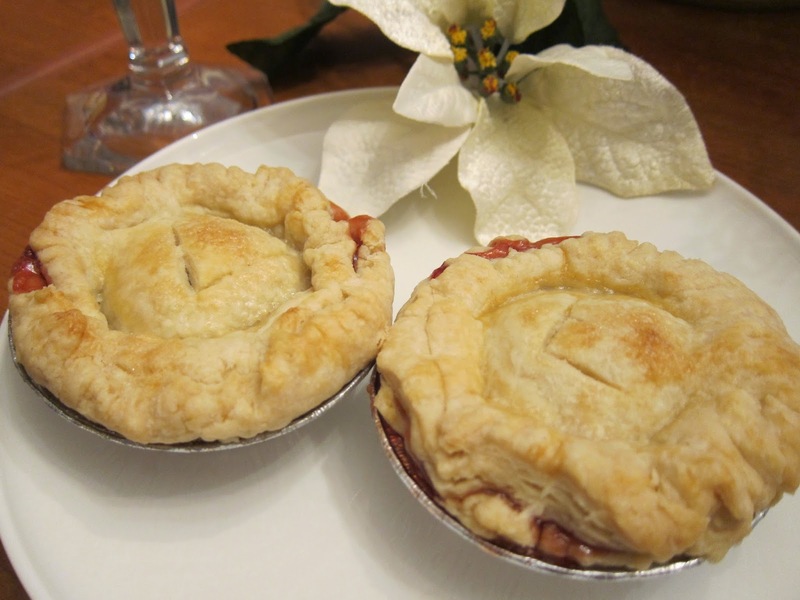 Rather than making the folded-over tarts I generally make, I thought I could make little tiny pie-shaped tarts as I had little tiny pie plates. I think they came out pretty well, don't you? Maybe the Gift Stash is Ready?